Strata, breakfast casserole, savoury french toast bake or bread pudding. It doesn't matter what you call this, it's totally delish and can be made ahead so it's great for feeding a crowd! It tastes like a cross between a quiche, french toast and an omelette. Heat a large non stick pan over high heat. (Use a bit of oil if not using non stick). Add all but 2 tbsp of bacon (reserve for topping) and cooked until lightly browned. Remove from the fry pan and drain on a paper towel. Place the bread in a large zip-lock bag. 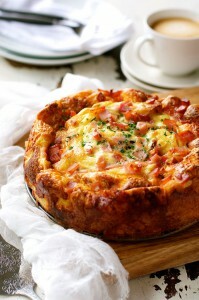 Pour in the egg mixture, 1½ cups cheese and cooked bacon (reserve the uncooked bacon). Seal and massage the egg into the cubes. Set aside in the fridge for at least 30 minutes (until all the egg is soaked into the bread) or overnight. Spray a 8" spring form cake tin. Pour the bread mixture into the cake tin, pat down to compress and scatter with remaining uncooked bacon and remaining ½ cup cheese. Cover loosely with foil or with a pan lid. Bake for 25 minutes, then remove the lid and bake for a further 10 minutes until bubbly and golden on top. Allow to rest for 5 minutes before removing the spring form and cutting into slices to serve. Garnish with parsley if using.